Bookride: The Surgeon's Mate. Patrick O' Brian. 1980. Patrick O' Brian. THE SURGEON'S MATE. Collins, London 1980. The seventh Jack Aubrey novel. Has the reputation of being scarce; it is said that having spotted first editions in remainder shops the distraught author began buying them up and destroying them. He seems to have missed quite a few. O' Brian took many years before he became known, respected and best of all bought. Even when this came out he was little known in the great US market. The Surgeon's Mate was not published there until 1992. He had a varied career before he produced 'Master and Commander' the first in the series. 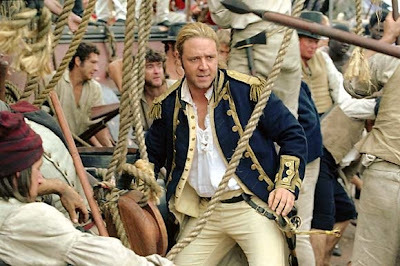 This was sympathetically filmed with the charismatic Russell Crowe (that's him below as Jack Aubrey.) Oddly enough the US ed is the first by a year (Lippincott, NY 1969 -nice jacketed copies $1000). His 3 earliest works Caesar (1930 - age 15) Beasts Royal (1934) and Hussein (1938) are written under his real name Richard Patrick Russ and are quite scarce and potentially valuable. They are all supposedly worth over $1000, even £1000 if sharp. However you don't tend to see them selling unless temptingly underpriced. 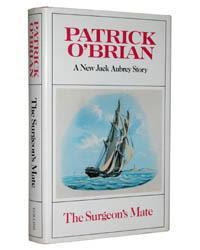 O' Brian collectors, although often moneyed, tend to be cut and dried - they want Jack Aubrey and Stephen Maturin - the books with the masts on the covers - and that's it. VALUE? There was a bookseller looking for £2500 for his at one point ('BEAUTIFUL RICH MAROON BOARDS DJ: NEAR FINE - SLIGHT CREASING TO WRAPPER - NOT PRICE CLIPPED AT £5.95' was the shouted description.) He appears to have gone pear shaped. A fine copy can usually be had for £1000 and possibly with discount on that. Near fine, sunned, price-clipped etc., - £600 - £800. O'Brian isn't making as much as he was in dawn of this century, there was a slight revival with the movie and other media like a TV series could enliven prices. A lot of collectors have now got the books and the market could falter if too many decide to offload--at present on ABE alone there are 1200 firsts in the series for sale.